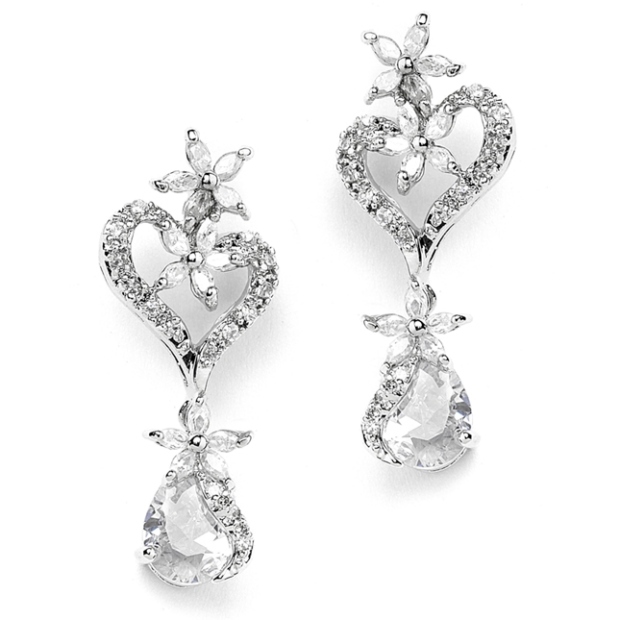 * Mariell's 1 1/4" h x 1/2" w sparkling Cubic Zirconia wedding earrings boast a breathtaking CZ heart, scattered CZ flowers & bold pear shaped drops. * These popular earrings are a great choice for brides, bridesmaids or mothers of the bride. * These unique Cubic Zirconia wedding earrings boast a breathtaking CZ heart, scattered CZ marquis flowers & dainty pear shaped drops. * At an attractive low wholesale price, these popular earrings are a must have for any retailer or stockists jewellery display. * Their distinctive design will offer your customers a fresh jewelry look that will have brides' friends running to your store for their own wedding accessories!